Here are a few hints and tips for the installation of X-Plane 11 (for Windows. For the Mac and for Linux, there are no big differences). The box comes with 9 DVD's. (8 DVD's for the simulator plus the "Global Scenery" and one DVD with the 3 included airports Lugano, Toulouse and Weeze. The installer is the same for both X-Plane 11 versions. It is on the DVD 1 or if you bought the download version in the respective shop account. Http://www.x-plane.com/desktop/try-it/ (One Installer, all of X-Plane). You can use it for the Box Version too. For later updates (also for the Box Version) an internet connection is required. If you have the download version, you need a key for the installation (to be found in your own shop account). If you have the box, then the DVD 1 must lie in the DVD-drive. To start the installation you can use the installer (execute) or if you have the box version simply insert the DVD 1 and start it. If the autostart does not work, open the DVD with the file explorer and start the installer (double click). The download version automatically displays a field for the key to enter. With the download version of course, no DVD is requested. In this case, X-Plane 11 is downloaded directly from the Laminar Research (developer) servers instead. The comuter must be connected to the Internet. Now you have to select the installation location. The default for Windows is a folder X-Plane 11 on the desktop. This can be left as it is, or you can choose with "change target" a different place. Note: Do not install in the C:\Program Files folder. This can cause writing problems in Windows. Here you have to agree to the EULA and (if you wish) send diagnostic data to Laminar. This is optional. So you can also deselect. Now you can choose the installation scope. Here you can select the Global Scenery you want to install. If you do not select everything, X-Plane will only display water in the unselected areas (no terrain, land). Selected areas are marked blue. You also can select and deselect directly in the graphics area. Even after the installation, you can install or remove areas. Simply start the installer again. Note: If not all Global Scenery is selected, not all DVD's are required. After a while, the next DVD will be requested. The DVD in the drive is ejected automatically. Now insert the requested DVD and close the DVD drive. The computer (rather the operating system) reads the DVD and continues the installation after a short time. Note: If there are problems, e.g. Windows does not recognize the DVD or does not recognize that a new DVD was inserted, then the installation does not continue. Often it is because the operating system is not adjusted to recognize newly inserted DVDs and to perform an action (Autostart ...). This can be set in the operating system. In the Run dialog box, type devmgmt.msc then press the Enter key. Ensure you check the Use AutoPlay for all media and devices check box. Select every drop-down menu and choose "Ask me every time" (or "open folder ...." next to every DVD, Blu-ray, and CD item, and then click Save. Additionally the DVD Drive must be correct installed and recognized (actual driver ...) with the operating system. Put the DVD's into the first DVD Drive if you have more than one installed with your operatingsytem. Additionally deactivate a "virtual drive" if you have one implemented with your operatingsytem. In most cases the DVD is not defective. Tip: In such cases you simply can take the DVD from the drive and put it into the drive again. Then the installation usually continues. Or another possibility: Just with the file explorer open the inserted DVD. Even then it usually goes on. If it does not work, post here in the forum. We will try to help. If all requested DVD's have gone through, the installation is finished with "Done". Depending on the version (burn date of the DVD's), an update must be done to get the current, actual X-Plane 11. The installer will automatically request this option if necessary. For the update action, of course, a working internet connection is required. Finally, you have an actual X-Plane 11 simulator. There is no difference between the download version and the box version. Further information can be found in the PDF file "read-me-first" on DVD 9 (in German at the time). With the download version, the 3 airports you find in a separate download file with your Shop account. You can start your X-Plane 11 with the executable X-Plane.exe .app or .bin (for Windows, MAC or Linux). You find it in the X-Plane 11 main folder. Or, if an icon was created on the desktop, double-click the X-Plane 11 icon. Further settings, with the started X-Plane 11 (joystick configuration, etc. ), can be found in the manual. If there is no manual in the "Instructions" directory (X-Plane 11 main folder), we will deliver it as soon as possible. Questions about the X-Plane 11 installation can be asked here in the forum. Please don't ask or post another themes or questions than X-Plane 11 Simulator with this Topic Theme (X-Plane 11 Installation Tips). For new themes please open new Topics. I bought the boxed version of XP11 from Aerosoft via Amazon.de. I went thru the complete installation process as you described above. However, when selecting all global scenery, installation stops during installation of DVD 8. I keep getting a 'no permission to write' errror (or something like that). In the status bar at the bottom of the installation window, I see that it 'hangs' at one particular data-file. No matter how often I select continue, it keeps throwing this error at me. At the end i can only select cancel and abort the installation. I checked the disk for physical errors (scratches and such) but didn't find any. This attempt was on a clean pc with a fresh Win 7 installation. Installed it on a separate physical internal hdd. Disks were read from an external drive. I then tried installation on my laptop. When trying to install all global scenery, it stopped after DVD 7. So, should I (re)turn to amazon instead or does this error sound familiar? 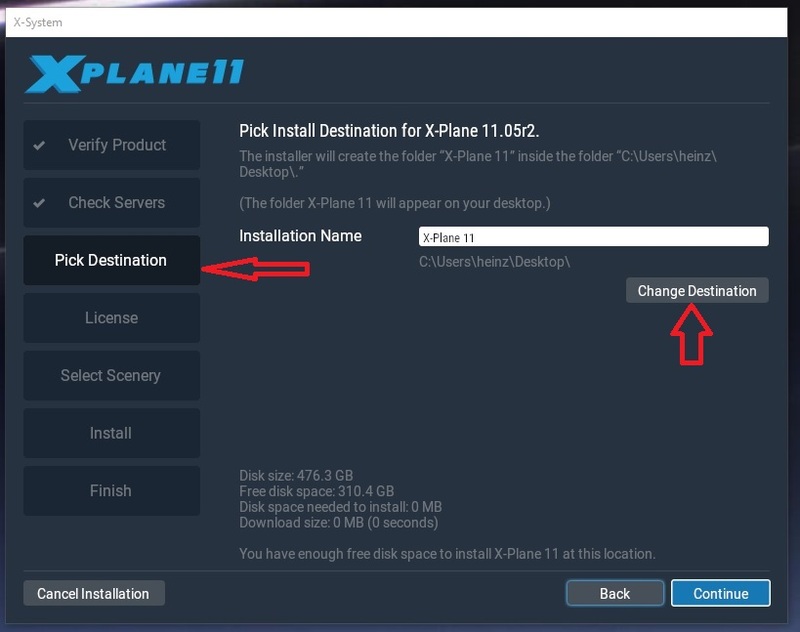 may be you don't have admin permissions to write some files from the X-Plane 11 installation DVD to the destination where you want to install X-Pane 11. Try this actual installer and run it with admin rights (right mouse button on the installer and then choose "run as administrator"). Don't use the installer from the DVD 1. To check if the DVD nr. 7 or 8 are defective, please try to copy the content to an empty folder of your harddisk. 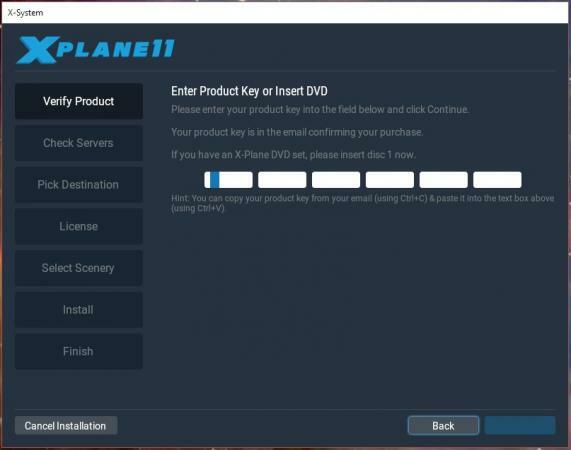 If this will work, then the DVD is ok.
What you additionally can do is to install X-Plane 11 without the global scenery (don't choose any scenery during the installation process). So only the DVD 1 will be used. If this is done you have installed the Simulator without scenery and now you can run the installer again to install the global scenery. Or you can manually copy the content of DVD 2 to 8 (contains the global scenery) directly into the correct scenery folder of the installed X-Plane 11. X-Plane 11 must be installed only with DVD 1 (without any global scenery data). I'm having problems with the installation of x-plane 11 (DVD) on a windows 7 system. My C: hard disk doesn't have enough space for it. I'd like to install in another HD but the option "select the installation location" doesn't appears in the install process. Any help? I'll try your detailed description. X-Plane 11 est maintenant disponible dans la première version finale. Les versions de boîte sont livrées et la version de téléchargement peut également être trouvée dans le compte de la boutique si vous l'avez acheté. Voici quelques astuces et astuces pour l'installation (pour Windows, pour le Mac et pour Linux, il n'y a pas de grandes différences). installation est le même pour les deux versions de X-Plane 11. Http://www.x-plane.com/desktop/try-it/(Un installateur, tout X-Plane). Vous pouvez aussi l'utiliser pour la version Box. Pour les mises à jour ultérieures (également pour la version Box), une connexion Internet est requise. Si vous avez la version de téléchargement, vous avez besoin d'une clé pour l'installation (à trouver dans votre propre compte de magasin). Si vous avez la boîte, le DVD 1 doit se trouver dans le lecteur de DVD. Pour démarrer l'installation, vous pouvez utiliser le programme d'installation (exécuter) ou si vous avez la version boîte, insérez simplement le DVD 1 et démarrez-le. Si le démarrage automatique ne fonctionne pas, ouvrez le DVD avec l'explorateur de fichiers et démarrez le programme d'installation (double-cliquez). La version de téléchargement affiche automatiquement un champ pour la clé à entrer. Avec la version de téléchargement bien sûr, aucun DVD n'est demandé. Dans ce cas, X-Plane 11 est téléchargé directement à partir des serveurs Laminar Research (développeur). L'ordinateur doit être connecté à Internet. Vous devez maintenant sélectionner l'emplacement d'installation. La valeur par défaut pour Windows est un dossier X-Plane 11 sur le bureau. Cela peut être laissé tel quel, ou vous pouvez choisir avec "changer de cible" un endroit différent. Remarque: ne pas installer dans le dossier C: \ Program Files. Cela peut causer des problèmes d'écriture dans Windows. Ici, vous devez accepter le CLUF et (si vous le souhaitez) envoyer des données de diagnostic à Laminar. C'est optionnel. Donc, vous pouvez également désélectionner. Vous pouvez maintenant choisir la portée de l'installation. Ici vous pouvez sélectionner le paysage global que vous voulez installer. Si vous ne sélectionnez pas tout, X-Plane affichera uniquement de l'eau dans les zones non sélectionnées (aucun terrain, terrain). Les zones sélectionnées sont marquées en bleu. Vous pouvez également sélectionner et désélectionner directement dans la zone graphique. Même après l'installation, vous pouvez installer ou supprimer des zones. Il suffit de redémarrer le programme d'installation. Remarque: Si tous les paysages globaux ne sont pas sélectionnés, tous les DVD ne sont pas requis. Après un moment, le prochain DVD sera demandé. Le DVD dans le lecteur est éjecté automatiquement. Maintenant insérez le DVD demandé et fermez le lecteur de DVD. L'ordinateur (plutôt le système d'exploitation) lit le DVD et poursuit l'installation après un court moment. Remarque: En cas de problème, par exemple si Windows ne reconnaît pas le DVD ou ne reconnaît pas qu'un nouveau DVD a été inséré, l'installation ne se poursuit pas. Souvent, c'est parce que le système d'exploitation n'est pas réglé pour reconnaître les DVD nouvellement insérés et pour effectuer une action (Autostart ...). Cela peut être défini dans le système d'exploitation. Appuyez sur la touche Windows + R pour ouvrir la boîte de dialogue Exécuter. Dans la boîte de dialogue Exécuter, tapez devmgmt.msc, puis appuyez sur la touche Entrée. Assurez-vous de cocher la case Utiliser la lecture automatique pour tous les supports et périphériques. Sélectionnez chaque menu déroulant et choisissez "Demandez-moi à chaque fois" (ou "dossier ouvert ...." à côté de chaque DVD, Blu-ray et CD, puis cliquez sur Enregistrer. De plus, le lecteur de DVD doit être correctement installé et reconnu (pilote réel ...) avec le système d'exploitation. Placez les DVD dans le premier lecteur de DVD si vous en avez installé plusieurs sur votre système d'exploitation. De plus, désactivez un "lecteur virtuel" si vous en avez un avec votre système d'exploitation. Dans la plupart des cas, le DVD n'est pas défectueux. Astuce: Dans de tels cas, vous pouvez simplement prendre le DVD du lecteur et le remettre dans le lecteur. Ensuite, l'installation se poursuit habituellement. Ou une autre possibilité: Juste avec l'explorateur de fichiers, ouvrez le DVD inséré. Même alors, ça continue habituellement. Si cela ne fonctionne pas, postez ici sur le forum. Nous allons essayer d'aider. Si tous les DVD demandés sont passés, l'installation est terminée avec "Terminé". Selon la version (date de gravure du DVD), une mise à jour doit être effectuée pour obtenir le X-Plane 11 actuel. Le programme d'installation demandera automatiquement cette option si nécessaire. Pour l'action de mise à jour, bien sûr, une connexion internet est nécessaire. Enfin, vous avez un vrai simulateur X-Plane 11. Il n'y a pas de différence entre la version téléchargeable et la version boîte. Aerosoft - Aéroport LSZA Lugano. De plus amples informations peuvent être trouvées dans le fichier PDF "read-me-first" sur DVD 9 (en allemand à l'époque). Avec la version téléchargeable, les 3 aéroports se trouvent dans un fichier de téléchargement séparé avec votre compte Shop. Vous pouvez démarrer votre X-Plane 11 avec l'exécutable X-Plane.exe .app ou .bin (pour Windows, MAC ou Linux). Vous le trouvez dans le dossier principal de X-Plane 11. Ou, si une icône a été créée sur le bureau, double-cliquez sur l'icône X-Plane 11. D'autres réglages, avec le X-Plane 11 démarré (configuration du joystick, etc. ), peuvent être trouvés dans le manuel. S'il n'y a pas de manuel dans le répertoire "Instructions" (dossier principal X-Plane 11), nous le livrerons le plus rapidement possible. Des questions sur l'installation de X-Plane 11 peuvent être posées ici sur le forum. Veuillez ne pas poser ou publier d'autres thèmes ou questions que X-Plane 11 Simulator avec ce Thème thématique (X-Plane 11 Conseils d'installation). Pour les nouveaux thèmes, veuillez ouvrir de nouveaux sujets. serveral time, with no luck. Use only this installer for that. If that is done, you can try to copy the other DVD's (the content of DVD 2 to 8) into the installed simulator. Go to the DVD-ROM drive (if using the DVD version), right-click it, then click Open, then repeat this process of right-clicking, but this time on the installer, and this time, and this is VERY important, select "Run as administrator"